Alan Maloney is now claiming he is the injured party, claiming defamation of character and emotional distress and claiming $100,000 in damages. Imagine being someone who attempted to humiliate a young high school wrestler, forcing the teen to cut off his dreadlocks or forfeit his wrestling match and now wants to claim to be the injured party. 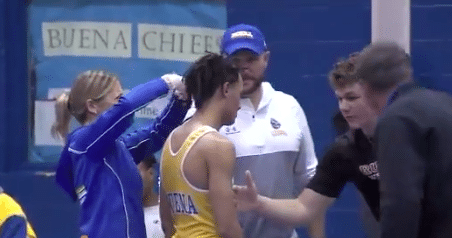 Imagine no more, because that is exactly what referee Alan Maloney, who infamously forced Buena Regional, N.J. high school student Andrew Johnson to make the difficult decision is trying to do. According to CBS News, Maloney has filed a tort claim notice to a dozen possible defendants claiming defamation of character and emotion distress and is also claiming some $100,000 in damages. The incident started back in December, just before Johnson began his match. Johnson, who had short locs, was told that he had to cut his hair, right there and then, or forfeit his match. This was despite the fact that he had his hair covering that wrestles typically wear if they have long hair. Video of the incident went viral, prompting shock and outrage. Following the incident, various accusations of racism were lobbed against Maloney. A fellow referee claims that Maloney called him the n-word in 2016. Maloney denied the accusation, but witnesses who saw the incident confirmed the story. Shortly after the fallout, Maloney was relieved from his duties and barred from continuing work in the school district. Now, Maloney has sent his claim, which preserves Maloney’s right to a possible lawsuit, CBS notes.